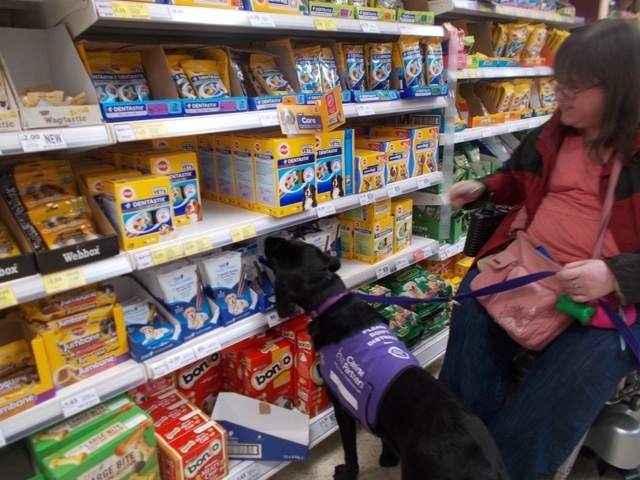 As today is the last day of International Assistance Dog Week I thought I'd tell you a bit more about my assistance dog, Elgin, and how he has transformed my life. 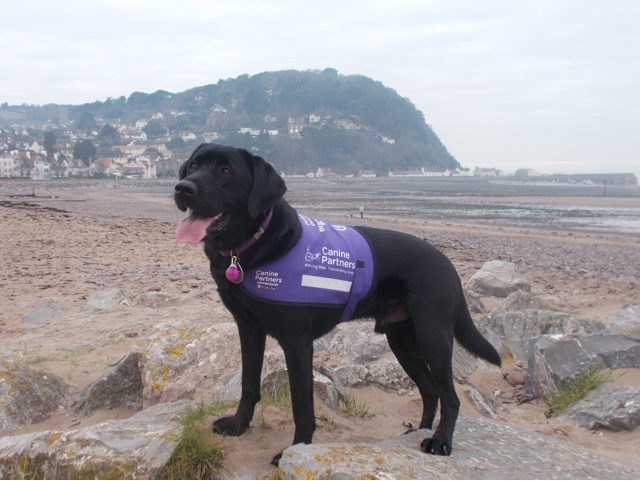 Elgin was trained by the assistance dog charity Canine Partners who train dogs to help adults with physical disabilities. He entered my life in August 2015, and in the two years since he has made a huge difference to my independence and quality of life. He is a fun, bouncy Labrador who not only helps me with physical tasks, but he has incredibly taught himself to alert me to medical episodes. Elgin is a very special dog and I feel extremely lucky to have him in my life, and I will forever be grateful to Canine Partners. In March Elgin saved my life by fetching help when I was choking on vomit and losing consciousness. He instinctively knew I needed help and ran off to fetch my mum from downstairs. I was unable to move from my position of laying on my back because both of my shoulders and knees had dislocated, but thankfully Elgin got mum and she was able to move me and dislodge the blockage from my throat. I wouldn't be alive today without Elgin, he's a true life saver. I have complex health conditions that effect my day to day life. In the last two years I have become reliant on a wheelchair full time due to repeated joint dislocations and severe muscle weakness. My joints are hyper mobile and very unstable - just reaching out to pick up an item can cause my shoulders to dislocate. It effects every joint in my body including my ankles, knees, wrists, elbows and even my jaw. The list of tasks he can help me with is endless, and he's constantly learning new things. Here are just some of the things Elgin can do - helps me dress and undress by tugging garments on or off. Tugs off shoes, hats (I have alopecia so always wear hats or scarfs), socks etc. 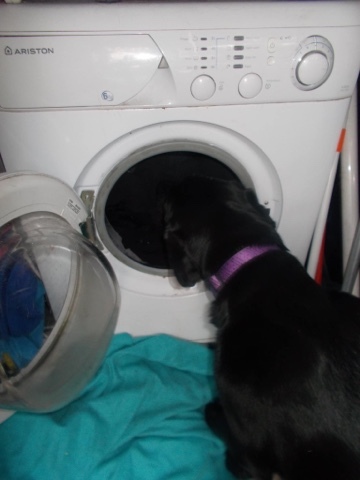 Loads and unloads the washing machine and puts it in the laundry basket. Takes items and notes to and from my carer for me. Picks up dropped items. He knows the names of dozens of items (phone, mobile, shoes, keys etc) and can fetch them from another room for me. Opens and closes doors in the house using tug toys that are attached to door handles. Fetching the phone when it rings. Raises the alarm or fetches help if I'm ill or fall. Raises and lowers the foot plates on my wheelchair. Picks up items off of low shelves in the supermarket for me (stretching for items often dislocates my shoulders ) and passes my purse to the cashier. Elgin loves task work and would work all day if I let him! Most of his tasks involve tugging or retrieving and it sees it all as a big game that he'll be rewarded for. My health has been rapidly deteriorating over the last year which means that Elgin has become even more important to me and my family. He is able to help me with a lot of things that a carer would previously had to do. This not only helps me be more independent, it takes a huge strain off of my mum and makes me feel less of a burden to her. I know this isn't how mum saw it, but I always felt guilty to be constantly her for help for little things like picking up a dropped phone, or helping me take off a cardigan. Mum is now able to have a bit of a social life again knowing that I'm safe with Elgin. Incredibly Elgin has also taught himself to alert me to high or low blood sugar levels (I'm diabetic) and he also alerts me to severe muscle spasms/seizures a few minutes before they start which means I can take medication earlier. This means the spasm is less violent and less painful than it otherwise would have been - they are so violent they cause my joints to dislocate. These are things he started to do naturally because of the strong bond between us. He wasn't trained to do this, but he is praised and rewarded for correct alerts so that he continues to do it - he is always so proud afterwards! I have also be having a lot of falls lately as transferring to and from my wheelchair is becoming more and more difficult. When I fall Elgin comes and checks that I'm awake (I've lost consciousness a few times because I've hit my head) by nudging me and licking my face. He then either gets my mum if she's home or he fetches my phone so I can call for help. 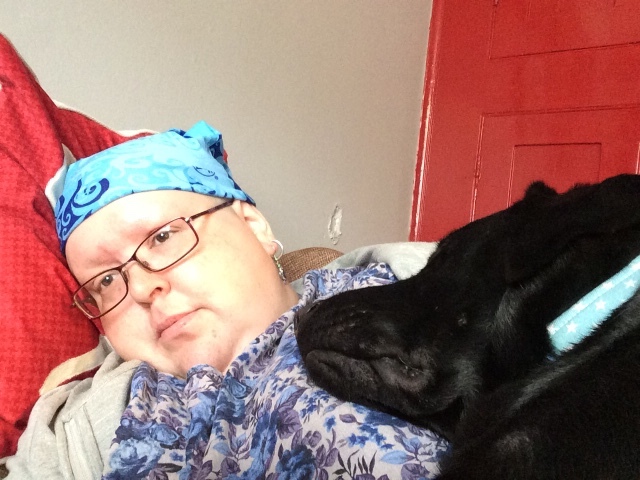 He then gets a pillow or cushion for my head to make me comfortable while I'm waiting for help, then he cuddles up with me and keeps me calm by making sure my attention is on him. He does all of this without me giving any commands now - he instantly knows what I need. Elgin is incredibly clever - sometimes he seems almost human! Since I've had Elgin the world has opened up to me again. 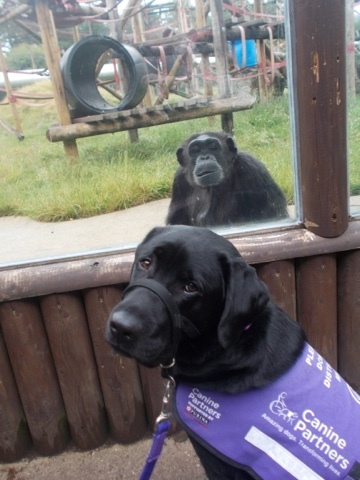 He's given me the confidence to leave the house and keeps me calm enough to visit places like Monkey World recently. I spent years not leaving the house but with Elgin by my side I now like visiting new places when I'm well enough. He behaves brilliantly wherever he goes and takes it all in his stride. He especially enjoyed Monkey World - he was fascinated by the primates and they were fascinated by him. His next big trip out is going to be to an aquarium which I'm sure we'll both enjoy. When Elgin first came to live with me I was still able to walk a few metres using crutches and Elgin used to fetch them for me. It's not a task he needs to do for me any more as it's no longer safe for me to use them, but I wanted to include this photo as I think it shows how much he enjoys his work. A very unflattering photo! Thus is Elgin refusing to leave me when I'm very unwell. He lays on my lap like this if I'm in my reclining chair, or if I'm in bed unwell he lays next to me in bed. He keeps me company, gives amazing cuddles and he is a great comfort to me when life is scary or getting me down. I'm always asked if he gets time to be a 'dog' and the answer is a big YES! 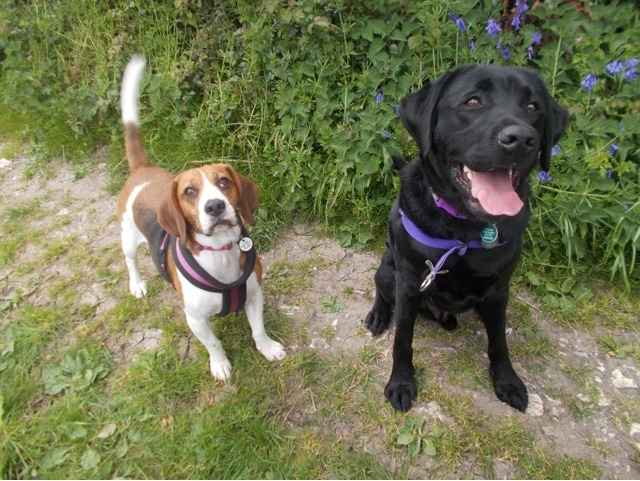 He spends most of the day playing with our young pet beagle, Cherry, goes on lovely walks and has great fun playing on the beach or park and the rest of the time he's asleep on my lap! He is also a mud magnet! 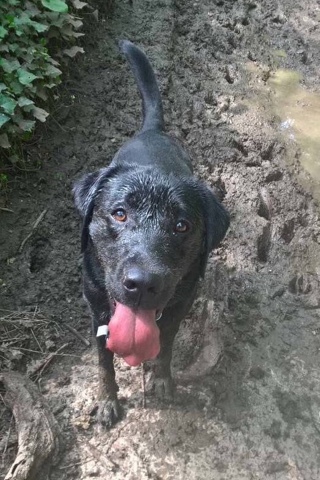 When he's having his off leads runs in the park or woods, he can find every single muddy puddle. If there's mud you can guarantee Elgin will be in it! 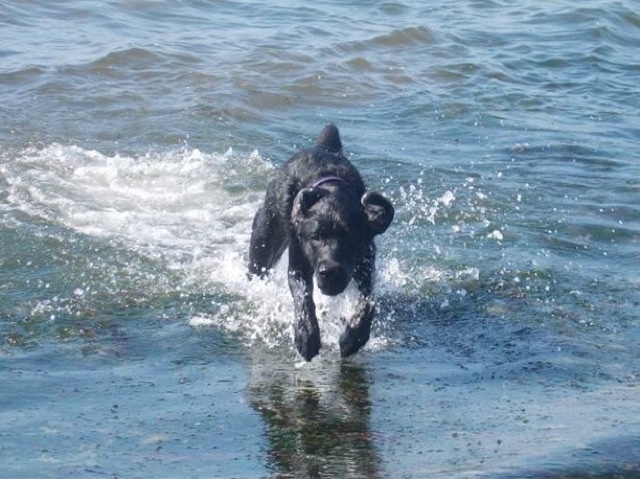 Elgin loves going to the beach and luckily for him we live only 200 yards from one! Unfortunately I can't get right down to the sea, but mum takes him down to the sea for me. I stay on the ramp and watch him running around having fun. Seeing Elgin so happy makes me happy, he is a joy to be around. I will forever be grateful to Canine Partners, Elgin's puppy parents, his foster parents, his trainers and all of the wonderful people that helped bring this incredible dog into my life. Elgin has drastically improved my quality of life, my independence, my self worth and my mental health - he is my hero. 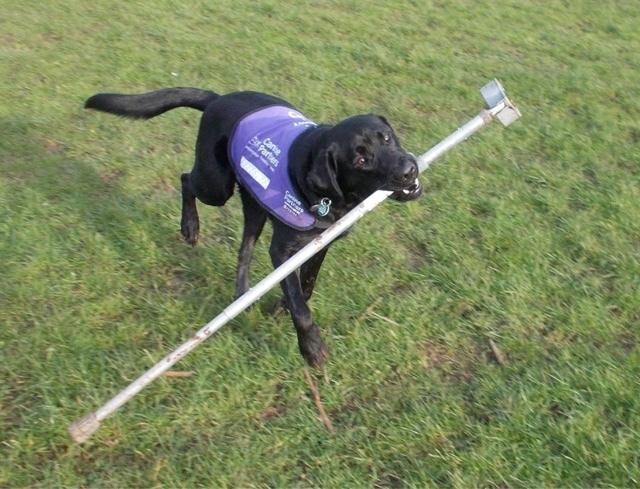 Canine Partners are a wonderful charity and I owe them, their volunteers and their supporters so much. They help so many disabled people and really do transform lives.